FAQ: What’s the impact on parking? For illustration purposes only, the diagram above shows the cross-section of an upgraded Laurier Blvd. While a final decision has not been made regarding which side of the street is best for the protected bike lane, various factors lean towards favouring the north side. Currently, on-street parking within the parameters of the City’s Parking By-Law is permitted on both sides along much of the length of Laurier Blvd. Spot surveys done over a multi-week period revealed a maximum of 15 vehicles parked on Laurier between Briarwood and Stewart. Following the street upgrade to include a protected bike lane, parking would be restricted on that side, and remain on the other side. One of the factors favouring parking on the south side is the adjacent sidewalk and grass boulevard, providing a loading/unloading area. While removal of parking on one side will be a change for some, parking capacity is not an issue, and parking concerns are secondary to safe multi-modal movement of people. Related questions have to do with waste/recycling pickup, bus stops, taxis, snow clearing, street sweeping and service firms. Waste/recycling: The pickup crews are pretty adept at weaving around parked cars and picking up waste/recycling from the curb which may be accessible between parked cars. The width of a protected double bike lane is no different. The truck will make its way along the outer edge of the bike lane’s bollards and stop for each pickup. Traffic goes around the truck when the way is clear, as happens on every street in town. Bus Stops: School bus stops and city bus stops will be built into the bike lane space as “bus bays”, for their use only. Bike traffic will stop for them (as everyone has to stop for school buses). Taxis: Taxis either pull into a driveway, or to the side of the road. With a protected bike lane, the “side of the road” on that side is beside the flexi-bollards. Passenger(s) depart, taxi moves on. Other drivers pass when clear or stop until they can proceed, as with any other two lane road in the city. Snow clearing is addressed in another FAQ. Street sweeping: The city uses street sweepers as well as sidewalk sweepers. The sidewalk sweeper will do a great job on protected bike lanes and the Brock Trail. Service firms: Lawn care, parcel delivery, etc. They either use the driveway or the side of the road, as on any other street. Other traffic passes when the way is clear. The side of the road is outside the bike lane. The sketch seems to indicate that there are yellow pylons along the road to separate the cyclists from other traffic. What will be the spacing of the pylons along Laurier? Has thought being given to providing alternate routes between Stewart Blvd and California? In a protected bike lane of this type, the lane is separated from motorized traffic with a 2′-3’/.7-1m painted buffer on the road surface, and then a line of “flexi-bollards” is set in the middle or slighlty to the motorized side of the buffer. The bollards are spaced 3m to 10m apart depending on sight lines, proximity to intersections, etc. 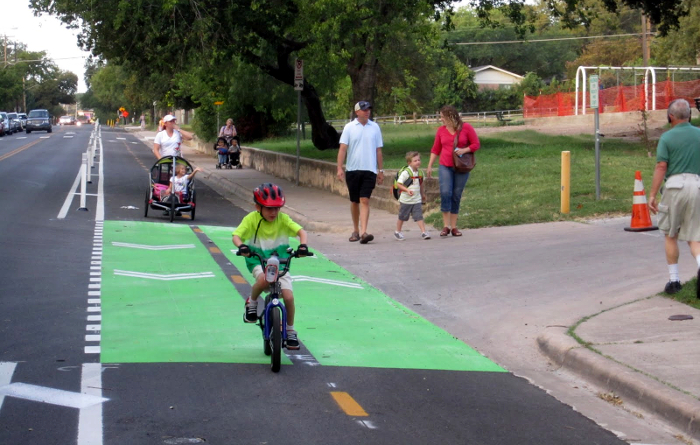 Where a driveway is crossed, the painted buffer becomes a block-pattern dashed line, per this photo from Austin, TX. Generally, residential driveways don’t have enough in/out traffic to warrant any additional signage or road markings, as the photo shows (it’s a school parking lot entrance). Commercial driveways are a different story though. Depending on the in/out traffic, additional signage or road markings may be warranted. In all cases, bike traffic in the bike lane has right of way over motorized traffic crossing it. Along Laurier, there’s one driveway per residence, yet very few commercial driveways (all on north side). A protected bike lane is a good configuration for this street context. Laurier was chosen in the cycling network plan as shown in the Official Plan because it’s wide (a four-lane paved corridor with only two lanes of traffic), giving room for cycling facilities, and because it links all the neighbourhoods north of the 401, and the Brock Trail. The cycling committee agreed with that and selected it for the first phase because of its ability to link all residents north of the 401 to the Brock Trail and then to downtown and the waterfront. Previous Previous post: FAQ: Do cycling facilities impact emergency response? Next Next post: FAQ: What happens in the winter?